About - Mud & Orchard I've had this table of my Babcia's for years. It was the first table she owned when she moved here and when they moved to the farm it became her canning table. Food from her garden, orchard, it was preserved there. She fed her family through the winter. She was alone out there, with just her family, a few friends, random visitors. She was content. I dedicate my thoughts to her. As is life, so much has changed from when I started this blog in 2011. We're heading in new directions, and I'm hoping the content of the site can change along with us. Nesting, or roosting, will be the word of the day. A new home in rural Scotland and a new baby on the horizon are sure to change our daily lives in ways I can't even begin to imagine. Thanks for remaining by our side. A look at our time in Germany and the nuances of adapting to a new language, culture and a changing support system. I've had this table of my Babcia's for years. 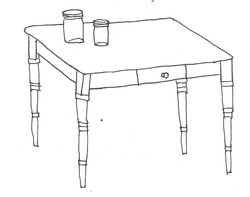 It was the first table she owned when she moved to Canada from Germany, by way of Poland, after the war. When they moved to the farm it became her canning table. Food from her garden, orchard, it was preserved there. She fed her family through the winter. She was alone out there, with just her family, a few friends, random visitors. She was content. I dedicate my thoughts to her.